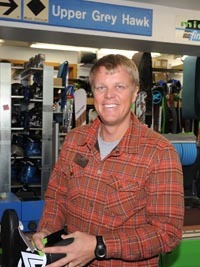 After 30 years of guidance under Rob Santa, Sturtevants Mountain Outfitters has new owners—store Manager Olin Glenne and longtime seasonal valley resident Ben Jacobson. The transfer was expected to take place on New Year’s Day. The purchase includes the businesses of Sturtevants three retail stores, in Ketchum, Warm Springs and Hailey. According to a news release from the store, Jacobson, an avid skier and mountain biker, is an investor in the business but will not be active in its daily management. The release states that Glenne is also an outdoor adventure enthusiast, experienced backcountry guide and competitive skier. Glenne said he won’t change the name and he plans to keep the current employees on board, though he might change some job descriptions and some of the “rules.” He said the transition has been in the works for quite some time. Santa said he’s excited to see Glenne take the reins. Santa said he bought the business in 1982 in much the same fashion, though he’d only worked there for three years at that point. He said that after more than 30 years of “a great ride” at Sturtevants, it’s time to pass the torch to the next generation of owners. Santa also said he will remain involved for another year or two to ensure a successful transition. “I look forward to having more time to enjoy the sports Sturtevants supports,” he said. Glenne said he and Jacobson plan to invest some money in improving both the interior and exterior of the business’ three stores over the next six to nine months. “Rob’s done a very good job with the business and it’s going to be my intention to continue to build on what he’s done so well,” he said.